It seems like these days you can learn just about anything online for free, but of course some of that information is better than others. The good news is there are plenty of reputable places to educate yourself online for free, and here’s a TechProceed.com's compiled list of 20 of them to get you started. The coolest thing about Internet learning is that you can take college courses which in the past were only available to people who forked over immense sums of money to attend elite colleges. Coursera brings a bunch of those classes together into one site, offering nearly 400 courses ranging from Introduction to Guitar from Berklee College of Music to Constitutional Law from Yale. Courses typically include videos and certain coursework (such as online quizzes) that must be completed in a certain amount of time, as these courses are monitored by a professor. Stop by regularly to see what’s new, or search for topics that interest you can put them on a watch list so you’ll be notified when a new class begins. Home to more than 3,000 videos on subjects ranging from SAT prep to cosmology, art history to calculus, Khan Academy is a great place to learn. Detailed courses are broken into smaller sections of text or videos for ease of learning that fits into your schedule, and all are self-paced so you can spend as much or as little time with the subject as you like. You can also leave comments or ask questions if you want more information or if something isn’t clear in the lessons. The OpenCourseWare Consortium is a worldwide effort to make college and university level course materials accessible for free on the Internet. Search for a specific topic that interests you, or search by language (20 are available) or the source of the coursework. There are more than 5,000 classes in English alone, covering everything from statistical thermodynamics (Middle East Technical University) to Epidemics in South African History (University of Cape Town) and Creole Language and Culture (University of Notre Dame). A global-learning resource with courses in English, French and German, ALISONcovers everything from SAT prep to health and safety courses required in Ireland. There are lessons on everything from study skills to American copyright law, currency exchange to nonprofit fundraising, and general accounting to negotiating when buying a house. Completion of a course grants you “certification,” which is a British designation, but it’s still kind of fun. If you always wanted to attend a big-name school like the Massachusetts Institute of Technology, now you can do the next best thing by taking many of its courses for free from your home on your own time. The MIT Open Courseware site posts course materials from a wide variety of classes you can search by department. Choosing a course will show you when it was originally taught and by whom, and will give you access to the syllabus, course calendar, readings, assignments and study materials. You can download the course materials and work through the course at your own pace. If you’d like a broader collection of courses than MIT provides, Academic Earthis a great place to look. This free course aggregator has a stunning collection of courses from around 50 universities across the globe. You can search by source or general subject. Don’t miss the curated playlists on topics such as natural laws, the nature of evil and the economic crisis. The video electives—with subjects like how to take a punch and why World War II made us fat—are lots of fun, too. The Open Learning Institute from Carnegie Mellon University allows access to a handful of course materials so you can learn at your own pace from the same kind of materials and self-guided assessments that would be used in a classroom. Their offerings are limited, but there’s a lot of detail in the coursework. Instructor-led courses are also sometimes available. This site isn’t very pretty, but Open Culture does boast a collection of more than 700 downloadable courses, including college-level, certificate-bearing classes, language lessons, educational materials for K-12 and more. There are also just some interesting links that aren’t to courses but you’ll still learn something from, such as this post on a reading list suggested by Ernest Hemingway. The well-designed Open Education Database claims more than 10,000 courses from universities from around the world. Search by topic and you’ll see the number of full courses, as well as which courses have audio lessons, video lessons or mixed media, so you can learn in whatever way you like. You can also use this site to learn about online and offline schools, should you choose to continue your education in a more formal way. Many of these same online courses can be accessed away from your computer with the help of iTunes U, a free app that can be downloaded to you iPad, iPhone or iPod Touch. It says that it includes 500,000 different courses, with material ranging from elementary school to college-level. There’s also educational material here from respected institutions like the New York Public Library and MoMA. You can also add notes to the videos, share with friends and keep your course materials in iBooks so you have everything you need to learn wherever you are. The TED talks are a legendary source of information on all sorts of topics, and any discussion of how to educate yourself for free online needs to include them. There are now thousands of videos on all sorts of topics available on the site. If you’re a fan of whimsy you can also get the site to suggest a fascinating, beautiful or informative video for you, among other tags. This may not be formal education but it certainly can be life-changing. Love videos by experts on all sorts of topics? After you visit TED, check out99U, which is another great source of educational videos on all sorts of topics. It has a strong focus on the subject of creativity, business development and innovation, so it’s sure to be of interest if you’re an entrepreneur or in a creative line of work. If you want to learn something new and you’re really pressed for time, check out Ignite videos. The purpose of this series of speaking events is to have each person share something innovative or inspiring in just five minutes. Sounds silly, but you can get a big dose of greatness in a short amount of time. If you prefer your learning to be text-based, check out Wikiversity. As you might imagine, this site is part of the Wikimedia Foundation and includes detailed pages on a variety of subjects. It includes information of value to learners from preschool to college and beyond, and like other wiki projects is open-source and collaborative. Do you use Gmail, the Chrome browser, or other Google service? Then Google may be keeping a record of every search query you make. That’s right; if you have a Google account, Google may know everything you ever looked for on the web. That is, unless you turn off Google’s collecting of all your searches and clean out the web history they’ve kept. Here’s how. Sign in to your Google account if you aren’t already signed in. Click the gear icon in the upper right corner (example shown in figure on the right). The page that opens contains the section shown in the figure below. Click the button “Turn off” to stop Google collecting the data. If you change your mind, you can always turn Web History back on. Previously collected data will still be there. To remove it, click the link contained in the word “delete” in the sentence, “You can also delete all past Google search activity or remove particular items from your recent activity.” The link is hard to see and I have highlighted it in yellow in the figure. What does Google do with this data? Why, they sell the information to advertisers, of course. Or maybe, they also give it to the government. Who knows? Sure, it’s handy that your smartphone can remember and fill in usernames and passwords for your various web accounts. But it also means anyone else with access to your handset can log in to your most sensitive accounts, too. Indeed, the more often you tap “yes” when your iPhone or Android phone asks “Would you like to save this password?”, the more saved passwords you have sitting in your pocket—and that could lead to big trouble if your precious smartphone ever lands in the wrong hands. A good rule of thumb is to select “Never for this site” or “Not now” when your phone offers to save passwords for your most important accounts, such as your online banking site. But what if you’ve already saved passwords for more sites than you can count? In that case, you might consider starting fresh by wiping all the web passwords from your iPhone or Android phone’s memory. You might want to think twice before saving passwords for sensitive online accounts on your iPhone. Scroll down to the Passwords section and tap “Clear passwords.” You’ll get one last chance to change your mind; if you’re ready to go ahead, tap the “OK” button. If you want your phone to stop asking to save web passwords, clear the check from the “Remember passwords” checkbox. Tap Settings from the home screen, then tap Safari. Next, tap AutoFill, then tap the “Clear All” button under the “Names & Passwords” setting. Sooner or later it happens to all of us – a Windows program gets hung up and just sits there frozen. You can open Task Manager (Ctrl+Shift+Esc) and try to close the hung program or use the command line to kill it. But sometimes you might want to see if you can find out why the program got hung up in the first place or you may want to try to unfreeze it. In that case, Windows 7 has just the system tool you need. Open Resource Monitor by entering “resmon” in the Start-Search bar. Alternatively, open Task Manager( keyboard shortcut Ctrl+Shift+Esc), and click on the "Performance" tab and then the button "Resource Monitor". An example of the window that opens is shown in this figure. In the CPU section of the "Overview" tab, right-click the executable file of the hung application. The listing of the hung application will be colored red. The context menu that opens is shown on the right. You can close the hung process from this menu or you can choose the entry “Analyze Wait Chain…” to see what other processes may be interacting with the hung program. If you know that an entry in the wait chain is not crucial you can try ending that process to see if it frees up the hung program. However, take care not to end a process that is vital to system operation. Ending a process here is not permanent, however, and rebooting the computer will normally restart everything. How to use Whatsapp on Computer? Are you the one who don't have a Smart phone? and still want to use whatsapp? Want to run android apps and play android games on pc? Then you are at the right place now you can use whats app on your PC for free.whats app helps you to connect with friends family. 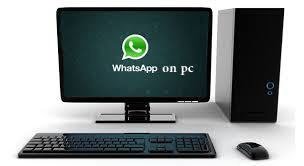 Yes its simple you need to install bluestacks offline installer to run whats app on PC. You can find downloaded app in My Apps.